LEED is changing the way we think about how buildings and communities are planned, constructed, maintained and operated. Leaders from around the world have made LEED the most widely used third-party verification for green buildings, with around 1.85 million square feet being certified daily. LEED works for all buildings—from homes to corporate headquarters—at all phases of development. Projects pursuing LEED certification earn points across several areas that address sustainability issues. Based on the number of points achieved, a project then receives one of four LEED rating levels: Certified, Silver, Gold and Platinum. LEED-certified buildings are resource efficient. They use less water and energy and reduce greenhouse gas emissions. As an added bonus, they save money. 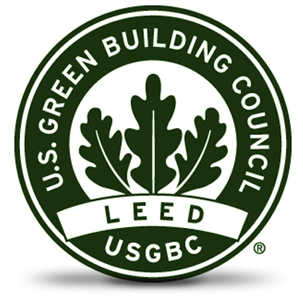 To learn more about why LEED continues to be the leading benchmark in green building worldwide, click here. Michal Vital-Baron has been certified as a LEED Green Rater and LEED Green Associate. Our firm works on International LEED projects in conjunction with the Active Energies. Active Energies is the leading provider of LEED for Homes verification services in the international market, based in Colorado, USA. The firm is currently working on a large Kibbutz Expansion in the Northern Israel, where over 10 new homes are being built using the LEED for Homes green building standard. We have completed LEED projects that are now in the certification process, planning to receive the LEED Platinum or Gold level of certification.